It wasn’t too long ago that I shared the delicious Layered Greek Dip that I absolutely ate way too much of. 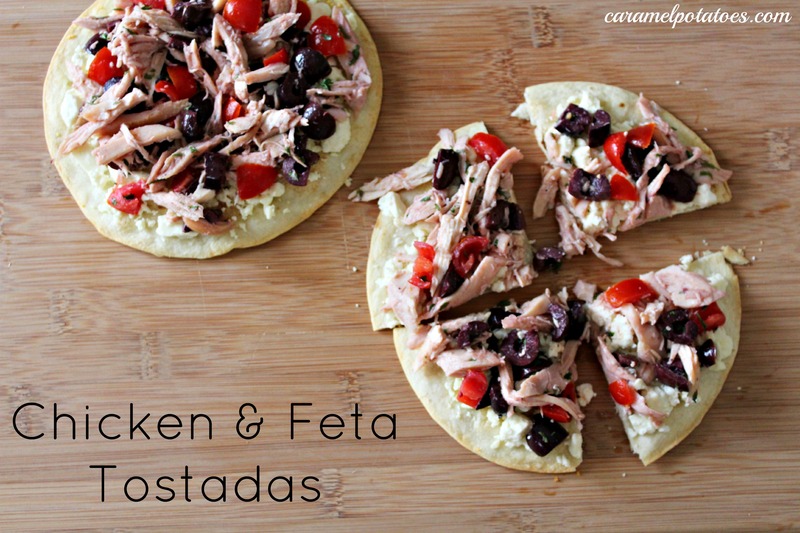 Well, it so happens that I had leftover kalamata olives and feta cheese and needed something to make; so when I came across this Chicken and Feta Tostada I knew it was meant to be. This mexican classic is given a greek twist. These tostadas cut into triangle make great appetizers, or serve alongside some fresh fruit and you have a great light dinner. Heat the oven to 450. In a large bowl, combine the tomatoes, olives, parsley, chicken, salt, pepper, vinegar and 3 tablespoons olive oil. Brush the tortillas on both sides with oil and then put on baking sheets, overlapping if necessary. Bake the tortillas until starting to brown, 2-3 minutes. Turn the tortillas and brown the other side, 2-3 minutes longer. Remove the baking sheets from the oven and top each tortilla with an equal amount of the feta cheese. Return the baking sheets to the oven; cook until the cheese is just melting, 1-2 minutes longer, Top the tortillas with the chicken mixture. *Recipe from Food & Wine, quick from scratch chicken cookbook.